WATERVILLE — Don’t be alarmed if four red-vested men with a single red rose appear on your doorstep today and launch into song. 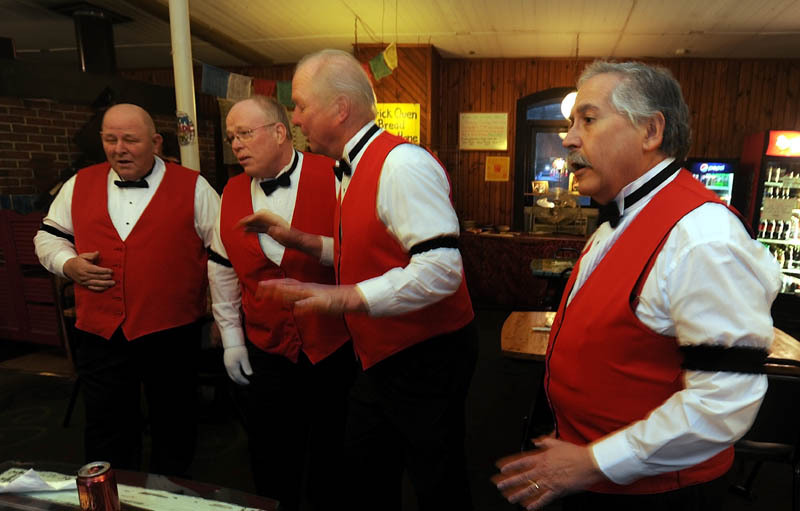 Today three quartets from the Kennebec Valley Chordsmen will fan out across three counties to perform singing Valentine’s Day cards to more than 30 unsuspecting sweethearts from West Gardiner to Dover-Foxcroft. It’s a service the group has been providing for six years. The quartets, with names like Buck and a Quarter, charge $35 for their appearance, which includes a card and a red rose. The organization uses the money to send youth singers to Harmony College Northeast — a barbershop singing camp held every year summer in Worcester, Mass. The Kennebec Valley Chordsmen formed in 1972 and celebrated its 40th anniversary in October at the Waterville Opera House. There are 24 members, plus four high school students that occasionally participate, Galen Larrabee said. Each quartet consists of a tenor, a baritone, a bass and a lead. On Wednesday, Buck and a Quarter performed a demonstration at Grand Central Cafe in Railroad Square to an amused audience of a few diners. The barbershop style of music began in the 1800s in bars, parlors and barbershops in the United States, then swept the nation in the 1840s and 1850s with traveling troupes, according to the website for the Barbershop Harmony Society, a national organization that strives to promote and preserve the genre. The style spread further in the United States through widespread sales of printed sheet music in the early 1900s and the growing popularity of touring quartets, but fell out of favor in the 1930s when new recording techniques gave rise to solo singers and an emphasis on melody. Larrabee said the quartets are almost completely booked for today, but the service is available for any occasion. For more information, contact Larrabee at 568-3538, Charles Maroon at 872-9650 or www.kennebecvalleychordsmen.com.